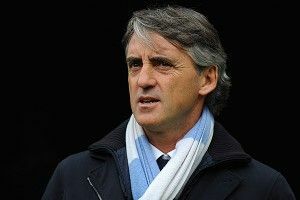 Entering the final weekend, Manchester City’s Roberto Mancini is poised to win both the battle of the minds with Manchester United’s Sir Alex Ferguson and the Premier League title, even though he’s loath to admit it. A storybook ending for “The Little Train That (received a multibillion-dollar overhaul and) Could.” The crosstown rivals both eked out wins Sunday, but one of the victories wasn’t like the other. In this week’s pod, the Men in Blazers recap both the wins in the penultimate weekend, take stock of the battle for third and fourth place, and then bid Blackburn and their fowl farewell as the second team to cement relegation to the Championship next season. Lastly, if these weekly musings have provided even the slightest inclination of entertainment, we at Men in Blazers would be honored if GFOPs would take a few moments to vote for MiB as soccer podcast of the year. We’re up against all the big boys in England, and finishing last is something we simply can’t stomach. Please don’t make us Wolverhampton.